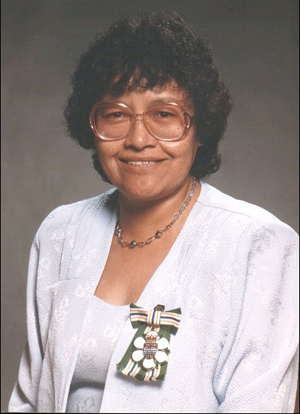 Phyllis Chelsea is a member of the Alkali Lake Indian Band. From an early age, she has shown remarkable courage and dedication in the pursuit of a better life for herself, her family and her community. Recognizing the devastating toll that the consumption of alcohol was having on her own family relationships, Phyllis Chelsea chose to change and became an abstainer. Through her efforts and example, members of her family and the entire community eventually achieved sobriety. It was not an easy task; Mrs. Chelsea met with hostility and opposition but she persevered and she prevailed. Mrs. Chelsea’s pursuit of a better life did not stop there. She fostered abused and underprivileged children. Her home became a haven for dozens of children seeking respite from dangerous home environments. She instituted local services to replace those provided by agencies unfamiliar with local traditions. She had the previously forbidden Shuswap language revived and recognized as a credit for University entrance at UBC. And she was the moving force behind the development of an Elementary School on the Alkali Lake Reserve. Because of her efforts, Alkali Lake is now a model for other native communities across Canada. Mrs. Chelsea has travelled with workshops and training sessions to help other communities. Her work is recognized not only in Canada but also in the United States and Australia. She recently received an Honorary Doctor of Laws from the University of British Columbia. Phyllis Chelsea’s commitment as a mother, grandmother and community leader, has given inspiration, hope and support to all who have known her.